Nate Bowen and Derek Martin are spending the week in an RV parked outside of Altoona's Peoples Natural Gas Field. You can't spell "Curve" without "RV." Coincidence? Almost certainly. Nonetheless, there is a new and inextricable link between team and vehicle. 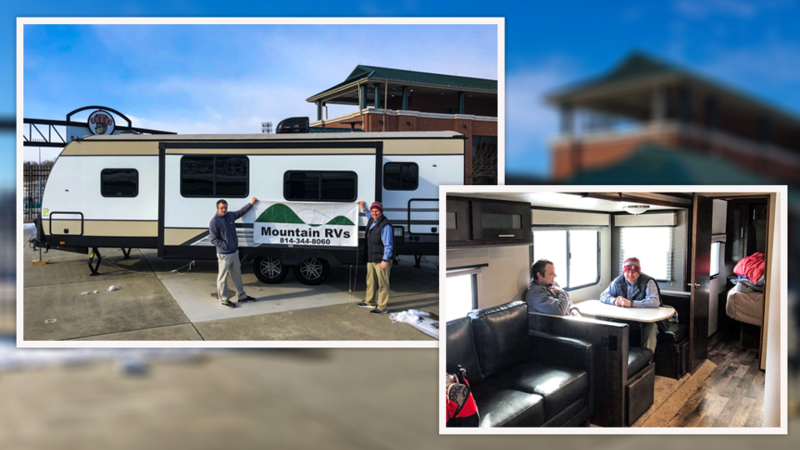 Altoona Curve general manager Derek Martin and assistant general manager Nate Bowen are spending the week in an RV parked on the grounds of the Curve's Peoples Natural Gas Field. Martin and Bowen's stunt began Monday morning and will continue through Saturday's "Curve Fest," when the Double-A Pittsburgh affiliate puts its single-game tickets on sale. The duo will not leave the ballpark grounds until the conclusion of Curve Fest. Their nights are spent hunkered down in an RV provided by one of the team's business partners. Martin sleeps in the bedroom "suite," with Bowen relegated to a pullout couch. "The RV was delivered Sunday. Mountain RVs supplied it -- they said they'd love to be a part of this," said Martin, speaking alongside Bowen in the RV late Wednesday morning. "They told us, 'Just know that it's not winterized, and there's no water.' That's OK. We can use the stadium bathrooms. And we knew it was going to be cold, so we have sleeping bags. Nate keeps me warm, and I keep Nate warm." As with so many Minor League front-office endeavors, a simple question arises: Why? "We're always looking to do something different, fresh, fun and creative. We sit down pretty much daily to discuss different things," said Martin, who worked for the Curve from 2002-07 before returning in 2016. He admits to being inspired by -- and wanting to one-up -- former Curve general manager Todd "Parney" Parnell, who once pulled a similar two-night stunt. "We want people to be like, 'What are they doing? Are they nuts?' That's what we're looking for. That's why we're working in Minor League Baseball. You have fun with it," he said. "Being together here [in the RV], I think the ideas will come. It's about learning more about each other, because on the leadership side, we have to be on the same page." Bowen, entering his seventh season with the team, was promoted to assistant general manager upon the conclusion of the 2018 campaign. He is well aware that in Minor League Baseball some of the best ideas come outside the scope of normal business hours. "We made our promo schedule announcement [Tuesday]," he said. "We're having a D-Day [75th] anniversary game. The idea for that began over a year ago. It started with a couple of us playing 'Call of Duty,' when we saw the date for D-Day. I had known of it, but then it became, 'Oh, the anniversary!' So we had that in mind because of video games." On Tuesday evening, Martin and Bowen were joined in the RV by a group of co-workers for a game of Texas Hold 'Em. But for the most part it's been just the two of them. "Boy, Nate is a super sports fan," Martin said. "He subscribes to ESPN Plus, and since we have no TV, he brought his laptop in and we watched the Deion Sanders '30 for 30.' He must have said about 85 times, 'There's no way this happens today!' So I'm learning about just how much of a sports fan he is and where his passion to work in sports comes from." That's been a two-way street. "I've learned about Derek's family," Bowen said. "Particularly that his middle child likes to throw things at televisions and that can be a costly experience." Indeed, Martin is a family man. The father of three young children has somehow convinced his wife, Abby, to support his RV stunt. "My wife is a high school teacher, and she's a saint," he said. "But she enjoys it, or at least tells me she enjoys it. But in the back of my mind, I know there will be repayment for this week in the RV. I don't know what it is, but it's something. And the kids are excited. They're coming over right after school to hang out and bring dinner." Martin and Bowen have been well taken care of when it comes to food, thanks to team partner restaurants that have delivered meals to the RV. But they've largely had to take a do-it-yourself approach. A signed team bat inside the RV serves as "security," while the visitors' locker room has been pressed into service as a clothes storage area. "One thing we don't have a lot of is healthy food, though we have plenty of candy and chips," Bowen said. "And I'm a runner as well. I can't leave the premises, so on the first day I ran 3.5 miles in the parking lot, in squares." The pair have two more nights left in the RV. Things could get interesting. "I've learned that Nate is a very heavy sleeper," Martin said. "I came out that first night, just testing the waters, and he didn't budge at all. So I'm thinking of some late night pranks to pull, going on Facebook Live. Put his hand in some warm water. I guess that makes you pee? Or maybe put some shaving cream in his hand and then tickle him with a feather, see if he slaps himself." No matter what happens, will it have been worth it? "This is about getting our partners involved, giving them shoutouts. And we've been getting a lot of impressions on social media, the majority of them local," Martin said. "I took a page out of the Parney playbook, and what he taught me is that you have to get people thinking of your team 12 months a year. Not just six. You need fun and interesting ways to incorporate the community. "I'd do anything for this team, to get the excitement going for 2019."